The barn holds your mailbox and the shed on the side holds your newspapers. 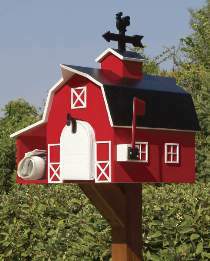 Designed to accommodate standard small, medium or large metal rural mailboxes. Hardware package includes all windows and doors necessary to complete the project when using the small size No.1 mailbox as pictured. Project with small mailbox measures approx. 26"H x 21"W x 26"D. Order hardware separately or see Special below which includes the plan and the hardware. Barn Mailbox Hardware includes four barn doors, two x grid windows, four + grid windows and mounting pins. Wood, mailbox and paint are not included.